It’s a once in a lifetime experience, so let our travel experts help you plan the honeymoon of your dreams. We can introduce you to some amazing locations and styles of holidays, from luxuriously dreamy beach front villas with infinity pools to more exotic cultural or adventure experiences. It’s the ideal alternative if you have already set up your home, meaning your friends and family can contribute to your honeymoon or dream holiday – the perfect start to married life! 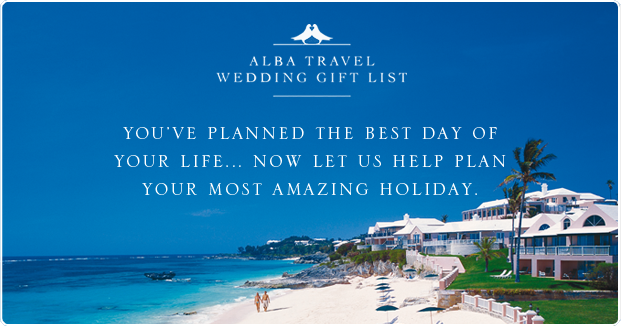 Alba Travel’s wedding gift service provides an account for guests to contribute to either a honeymoon or a future holiday for the happy couple. It saves any hassle of wondering what to buy the newly-weds and guests can give as little or as much as they like. Alba Travel provides the bride and groom with small cards to enclose with their invitations, which lets guests know about the wedding gift service and how to contribute.